Steiff Piggilee Pull-Tail Pig, from the Happy Farm collection, is made of beautiful soft pink plush for a baby's delicate skin. 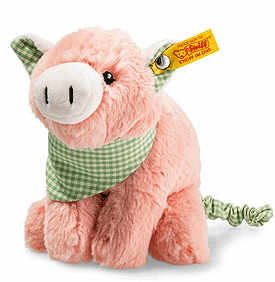 The pink-coloured Happy Farm Piggilee pull-tail pig measures 18 cm and is made of soft cuddly plush. It makes a ideal playmate. The green and white chequered neckerchief is removable. The chequered pattern is also applied to other parts of the body. The soft white snout is ideal for baby to grasp. The eyes are lovingly embroidered. As soon as baby finds out what to do to get Piggilee wiggling and moving about, there'll be loads of fun pulling on Piggilee's ring-tail. This addorable Piggilee Pull-Tail Pig has embroidered safety eyes . CE marked. Size 18cm. Surface washable.